Justin Allgaier picked up the 2nd last-place finish of his NASCAR Sprint Cup Series career in Saturday and Sunday’s Bass Pro Shops NRA Night Race at the Bristol Motor Speedway when his #46 Pilot / Flying J / Battle at Bristol Chevrolet was involved in a four-car accident that ended his day after 354 of 500 laps. The finish, which came in Allgaier’s 76th series start, was his first of the season in his first Cup start of 2016. After two difficult full seasons in Sprint Cup with just one top-ten finish, Allgaier returned to XFINITY Series competition this year, bringing with him longtime sponsor Brandt Agriculture. Teamed with JR Motorsports, Allgaier has assembled a respectable season, coming into Bristol 5th in series points with 18 Top Tens, 9 Top Fives, and two runner-up finishes, including a controversial “freeze the field” situation at Daytona. Allgaier continued the momentum at the short track, finishing 2nd once more, this time behind Austin Dillon, lifting him to 3rd in series points. 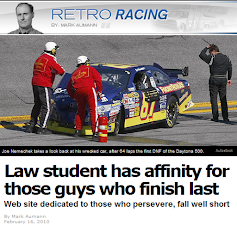 Ordinarily, that would have been it for his Bristol weekend, and he’d set his sights on next Saturday’s round at Road America. But it didn’t turn out that way. Michael Annett was slated to run the #46 on Saturday, hoping to bounce back from a last-place run in the 2015 event where his engine shut down one-quarter of the way through the first lap. 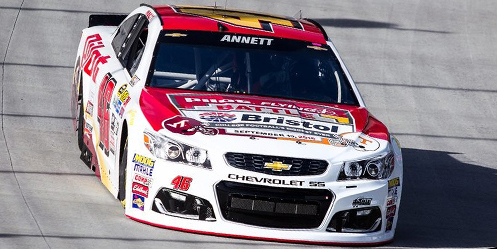 To promote next month’s “Battle at Bristol” college football game between the University of Tennessee Volunteers and Virginia Tech Hokies, a game sponsored by Annett backers Pilot and Flying J, the Chevrolet would carry the same reversed scheme from the spring race with both team’s colors. Annett ran 38th-fastest in both Friday’s practices and slipped to 39th in qualifying with a lap of 123.626mph. Through the weekend, Annett was suffering from flu-like symptoms, and it was announced early Saturday that he would not be running the race. Allgaier, who ran HScott’s #51 the last two years before he was replaced by Clint Bowyer, became the replacement. The driver change meant Allgaier would move one spot back to the rear at the green flag. On Saturday night, Allgaier joined last-place qualifier Josh Wise, his owner’s company Curtis Key Plumbing featured prominently on all corners of the #30 Chevrolet. Wise had been forced to a backup after he blew a right-front tire in practice, damaging much of the right side of his machine. Allgaier passed Wise by the end of the first lap, then on Lap 3 Jeffrey Earnhardt slowed on the apron of Turn 3. Earnhardt reported no power on his #32 Can-Am / Kappa Ford and made an unscheduled stop for repairs. On Lap 10, Earnhardt returned to the track eight laps behind. He was nine down, still in last, when rain halted the night’s activities and pushed the race to Sunday. Earnhardt re-started the race in 40th, and was quickly joined by Wise and Cole Whitt, who each made unscheduled green-flag stops that left them four and three laps behind, respectively. 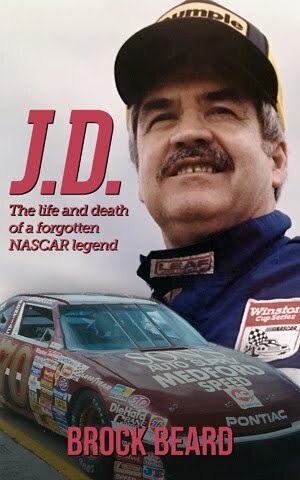 On Lap 104, Wise slowed to make a second stop, this time for an extended stay, and finally wrestled last from Earnhardt on the 112th circuit. By the time Wise returned to the track on Lap 135, he was 35 laps behind the leaders. Cole Whitt then took his own turn behind the wall around Lap 172, dropping him to 39th behind Earnhardt, then behind Wise for last around Lap 210. Whitt also returned to the track, his #98 circulating by Lap 224, 51 behind. Next to enter the last-place battle was Tony Stewart, who on Lap 259 pulled behind the wall in his #14 Haas Automation Chevrolet. Stewart, making his final Cup start at Bristol, had suffered a serious vibration which required he crew replace the right-rear hub and wheel assembly. 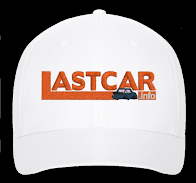 The driver was skeptical of returning to the race, saying “If there’s something we could gain, I’m all for it,” and the team convinced him to run as many laps as he could to shore up their place in the Chase. On Lap 279, Stewart returned to the track 20 laps down in 38th. By then, Wise had pulled the #30 into the garage for another ten laps, keeping him 39th, then taking last from Whitt on Lap 282. Wise took a couple laps short of the 300-lap mark, pulled back in on Lap 296, then returned on Lap 324. At that point, all 40 cars were still running: 40th-place Wise was 80 laps behind, 39th-place Whitt 51 down, and 38th-place Stewart back by 29. They remained in that order when trouble broke out on Lap 358. Kyle Busch had dominated the first part of the race, grabbing the lead from the 3rd starting spot just before Saturday’s rains came, then pacing the field for 256 of the first 347 laps. But shortly before Kevin Harvick passed his #18 M&M’s 75th Anniversary Toyota, Busch noticed something was off inside his car. Heading through Turns 1 and 2, the suspension gave way, and the #18 broke loose and spun to the inside of the track. For an instant, the #18 remained otherwise intact, though with the passenger side exposed to oncoming traffic. Entering the scene was Justin Allgaier. Three laps down near the back of the pack, Allgaier briefly looked low to follow Regan Smith to the apron, then cut right. The turn slammed the left-front of Allgaier’s #46 into the right-front of Busch’s Toyota, sending Allgaier’s car sliding up the track - directly into the path of the Top 5-running cars of Martin Truex, Jr. and Kyle Larson. During his interview in the garage area, Busch was irate, blaming Allgaier and his spotter for what he felt was an unnecessary collision. 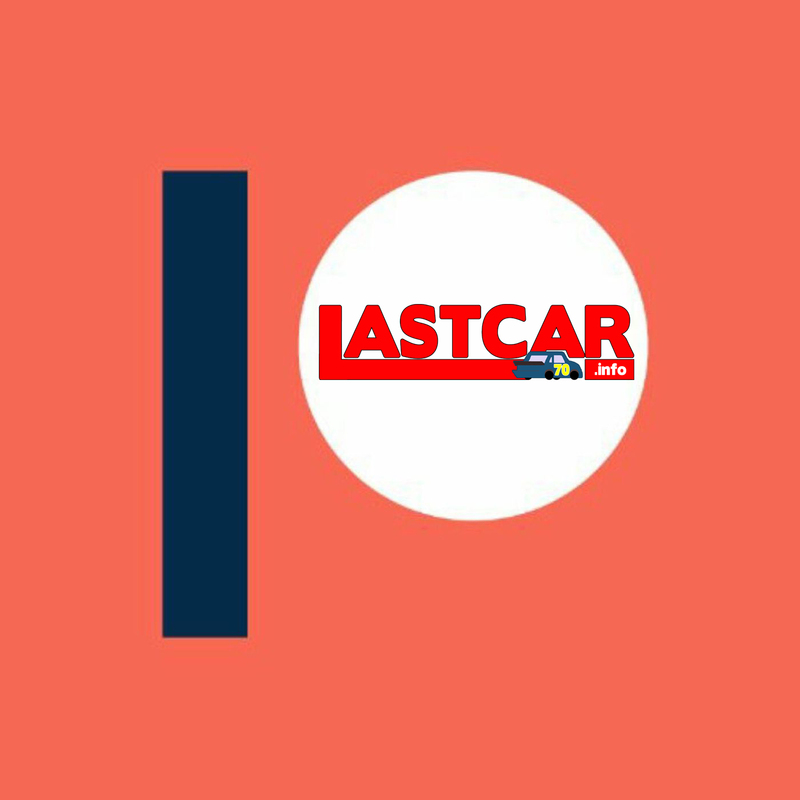 Both Busch and Allgaier failed to return to the race. 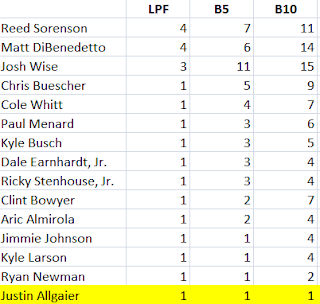 By track position and his number of laps down, Allgaier took 40th behind 39th-place Busch. Finishing 38th was Kyle’s older brother Kurt, whose #41 Monster Energy / Haas Automation Chevrolet was gobbled-up in another multi-car wreck on the ensuing restart. Busch’s #41 broke loose off Turn 4 and was helped around by Joey Logano’s #22 Shell / Pennzoil Ford, giving Logano’s teammate Brad Keselowski nowhere to go. Keselowski’s #2 Autotrader.com Ford slammed into Busch, and the two spun to the apron, sparking a chain-reaction that collected nine other drivers. One of them, 5th-place starter Matt Kenseth, ended up 38th after his #20 Dollar General Toyota was struck in the door by Ryan Blaney’s #21 Virginia Tech / Motorcraft Ford. Wise, who came home 84 laps down, rounded out the Bottom Five. *This was Allgaier’s first-ever last-place finish in a Cup race at Bristol. I would advise that you go with the #1 Forex broker: eToro.